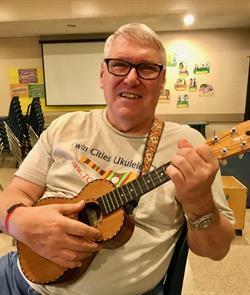 Lil Rev is an award-winning Sheboygan, Wisconsin based, Ukulele instructor, entertainer and mult-instrumentalist. Known as a "protector" of old songs and strum styles, Rev is an avid collector of old time recordings and his participatory concerts are a virtual study in Early country, Jug Band, Novelty, Yiddish, Pre-War Blues and American Folk traditions. 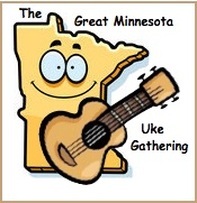 Raised in Milwaukee, Wisconsin, Rev tours North America teaching and performing at ukulele clubs, music stores, festivals, temples, house concerts and historic theaters often performing his one-man cultural history shows celebrating Tin Pan Alley, Yiddish, Blues & Jews, Quilting and Stephen Foster. Lil Rev was Voted Best Folk Singer in Wisconsin - 2003 (WAMI). 1996 National Blues Harmonica Champion at Avoca, Iowa. "Lil Rev is a Wisconsin Treasure." - UWM Folk Center. Del Rey started playing guitar when she was four years old. At thirteen, she was immersed in the world of folk music, via the San Diego Folk Festival. She has tried to get a whole band onto her solo instrument from the beginning. This gives her music an interesting complexity, especially when applied to the ukulele. Rags, blues and tunes of the early 20th century are her specialty, even as she writes new music to add to the tradition. Del also has fashion sense that would make Minnie Pearl smile. Del has taught and played all over the world, and brings her distinctive finger-style approach to guitar and ukulele to her teaching DVDs on Homespun “Boogie-Woogie Guitar” ” The Music Of Memphis Minnie” , “Memphis Uke Party” and “Blue Uke. Her albums can be found at www.hobemianrecords.com. 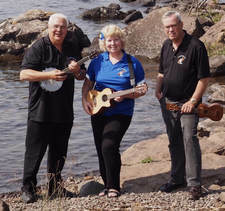 Dale, Brenda and Al are members of the Two Harbors Ukulele Group - T.H.U.G! You haven't been to an "over-the-top" uke open mic and jam until you sit in on one led by this trio. Don't miss them leading the mid-day Saturday event. We might even see some fancy dancing from one of the duo. And, if we are really lucky, there might again be a 455 Rocket during the ukulele open mic/jam. It all started back in 1999, when Laurie spent much of the year traveling in southeast Asia. It bothered her when she learned that each year hundreds of young girls from poor rural villages in Nepal were given the “opportunity to get a nice domestic job with a rich family in India,” only to be whisked across the border, sold to a brothel and raped twenty times a night. However, she wondered what she could ever do about this. Her answer, the Survivor Girl Ukulele band. In 2014, Laurie took the Survivor Girl Ukulele Band project to a shelter home in south India and taught ukulele! She felt a call to move on from there and work with girls in Kolkata, and she has been partnering with a well-known organization since 2015. From her base in Kolkata, living and working inside the shelter home, she has been able to expand the project to additional shelter homes and has also begun to partner with an organization in Bangladesh. Laurie believes music can be a powerful tool in restoring wholeness and building hope for a better future. Friends, family and kind strangers from around the world send their love to the girls, and the ukulele is fabulous little vehicle to deliver that love. Find out more at www.sgub.org. Laurie will teach us one of the songs the Survivor Girl Ukulele Band sings. Rhonda Laurie is a jazz/pop vocalist performing at concert venues, clubs, special events, and private events. Her smooth style and unique phrasing create direct communication and conversation through song. She is also a vocal coach who works on vocal development, repertoire and interpretation. Plus, she loves playing, teaching and sharing the joy of ukulele (and banjolele too)! Wh﻿y - Because You just never see someone playing a uke without a smile on their face!